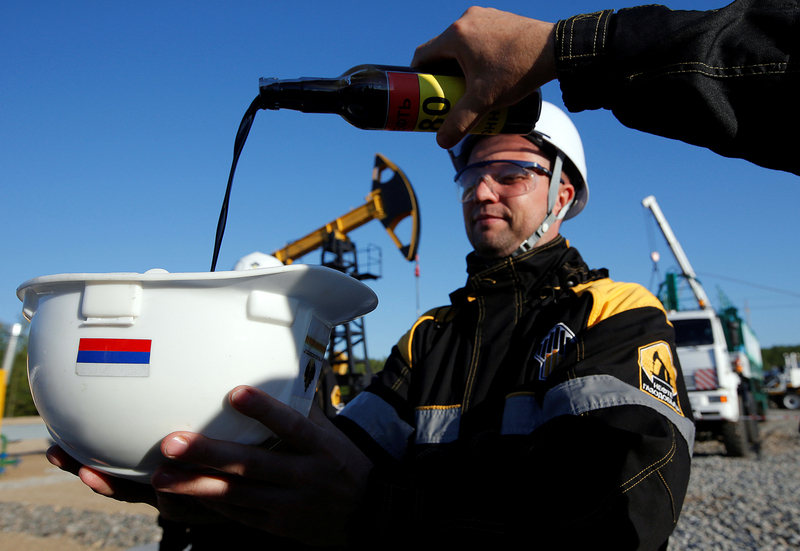 Employees demonstrate a sample of oil from a well at the central processing facility of the Rosneft-owned Priobskoye oil field outside the West Siberian city of Nefteyugansk, Russia. Russia’s oil major plans to supply 20 million tonnes to India in the future. Rosneft plans to supply to 2 million tonnes of oil to India this year, the Russian oil major’s Chief Executive Igor Sechin told Russian President Vladimir Putin on Jan. 23. “We will begin with 2 million tonnes this year and will increase this to 20 million tonnes, which corresponds to the refining capacity at the Essar refinery in Vadinar, which will now also become affiliated to Rosneft,” Sechin told Putin. Rosneft signed a contract to purchase 49 per cent of the shares of Essar Oil Limited in October 2016 after the summit meeting between Russian President Vladimir Putin and Indian Prime Minister Narendra Modi. Another 49 per cent of Essar Oil was purchased by a consortium of investors, the shares of which are distributed as follows: European commodity trader Trafigura – 49 per cent, the United Capital Partners (UCP) group, owned by Ilya Shcherbovich – 49 per cent and Essar – 2 per cent. The $12.9 billion deal is the largest ever foreign direct investment in India. India, which is looking to reduce its energy dependence on Persian Gulf countries, has also signed liquefied natural gas supply agreements with Gazprom.